HOME COMING OR GOING BACK HOME? 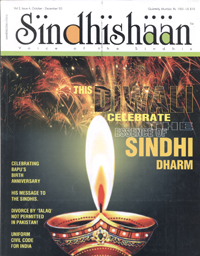 The number of Sindhis, who left their homeland after the partition in 1947, who could have carried some memories of Sindh would all be currently aged 60 years plus. Maybe a small percentage of this miniscule population, now happily retired and economically independent and financially strong would find the sentimental and emotional yearnings difficult to resist. But would they opt for another upheaval in their lifetimes? And as far as the second option is concerned I feel there would be extremely few takers. But what cannot be denied is if the possibility of being able to visit Sindh freely becomes a reality, thousands of Sindhis would take advantage of this opportunity. The youngest of the first generation of Sindhis born post-partition would now be in their early thirties and the eldest in the mid fifties. Having being fed on stories about Sindh by their elders during their youth, stories implanted in their memories; they would relish visiting their ancestral homes and experiencing the sights, sounds and smells of Sindh firsthand. The reaction of the second post-partition generation is difficult to predict. With no firsthand ties and bonds nor with any stories or anecdotes of firsthand ties and bonds of their parents – visiting Sindh would probably be an interesting holiday or a pilgrimage to the place of their community’s origin. But still quite a few would undertake this journey – out of curiosity and to seek their roots. But can this possibility transform into a Reality? Ram Jethmalani on his return from “Peace Mission to Sind” minced no words and categorically stated that there was no reason relations between the neighbouring countries could not improve, leading to free travel. What was required was a positive attitude from the leaderships of both countries. • Jammu & Kashmir to be recognized as the core issue – as demanded by Pakistan leadership. • End to cross border terrorism – as demanded by Indian leadership. put forth by both sides should be dropped and DIALOGUE MUST START. Let the dialogue commence - dialogue between journalists, artists, businessmen. Let trade and cultural exchanges begin – over a period of time the two conditional issues will also get resolved – just as it seems to be happening between India and China. Both countries have matured now – the nations are 55 years old. Tantrums, street fights and fisticuffs associated with teenagers; blackmail, threats and manipulations associated with middle age must now be discarded. Come on man we’ve come of age now and should be above such things and act like mature elders. – WHERE THERE’S A WILL THERE’S A WAY. GIVE US A CHANCE TO VISIT THE LAND OF OUR ANCESTORS BEFORE WE OURSELVES BECOME HISTORY.